Good morning sweet friends! Here is today’s card for giveaway to one of you! 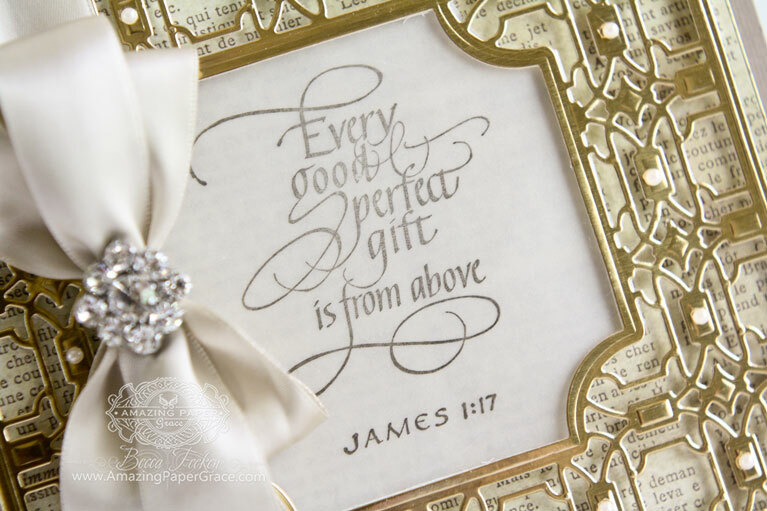 For Day of Friday Giving I have a new card with a wonderful scripture stamp from Quietfire Design – Every Good Perfect Gift. I love a sentiment that you can send for any occasion! To pair it with dies that need nothing else to shine, make for a card you’re more likely to put together. I get a lot of mileage out of framed cards because the frame is the decoration and the frame absolutely completes the card! So in short – you can make a card that looks just like this. Today I selected a die from the new(ish) Art Deco Collection with Spellbinders. I’m telling you – the die does all the work! I simply cut an aperature in my gold foil paper using Spellbinders Labels Thirty Five. Once cut, I centered the opening over Spellbinders Deco Lux die template and cut. This gave me a frame. I stamped my sentiment onto vellum so that it would not need to compete with the print background and trimmed the vellum so that it would fit within the frame. The sentiment is adhered with one layer of foam tape and the remainder of the frame is adhered with two layers of foam tape. It’s that easy. Now the Deco Lux die cut out is 6 x 6 and since I wanted more accent around that frame I started with a card base that is 6-3/4″ x 6-3/4″ – since there are so many envelope makers on the market, making a custom envelope for this card is no problemo :-) The gold rimmed layer that sits on my card base is 6-1/4″ x 6-1/4″ (using the Hinged technique to make the card base). Every Friday it’s my pleasure to give away a card. The card goes to a randomly picked reader (worldwide) who leaves a comment in our conversation. Want to know more about Day of Giving, here’s a link to my FAQ’s just check out #11. For your comment today: What’s your favorite way to show kindness? Accessories: Spellbinders Labels Thirty Five, Spellbinders Deco Lux, Satin Ribbon – Paper Source, Button from my Stash Sending hugs my friends. Hang in there with me, I’m so slow in completing all my background tasks and it’s just me to do the work but I’m yearning to be back here and will be soon. Don’t give up – I have lots locked up in my mind to share, I’m just working though some projects that will keep Amazing Paper Grace strong. Have a great weekend! Yet another stunning card! My way to show kindness is to always be there when a helping hand is needed. Hi Becca, What an amazing card here again today. All your work is always sooo beautiful, and I love how they most times can be used for different occasions. My way of giving is to make a special card for someone. I can’t sing or am musical one bit or have any real talents, so I use the small talent God has given me to create cards to give away. I know they are not on the scale of your awesome cards, but I’m proud of the ones I make. And I do think they are appreciated. What a stunningly beautiful card! My favorite way to show kindness is to send cards! Sometimes l send them anonymously. Even with all of the technology I think people still love to receive “mail”. And a handmade card is special!! This is so beautifu, wondered when you would use this die. Was patiently waiting as it one of the first ones I bought at Scrapbook Expo in Orlando. When when I saw it, I had to have this one and you are right – it makes the card. Yours is lovely as always. My fav way to show kindness to make a personalized card. I did 5 this week for my daughter’s nurses when she was in the hospital, 1 for her doctor (surgeon) and one for my husband and my ex-doctor’s 70 birthday. All 7 made the same but with doctor and nurse embellishments. Love doing mass production. What a beautiful card. Acts of kindness don’t get near the attention that they should. If only reporters would start focusing on the good rather than the bad, changes might be seen?! 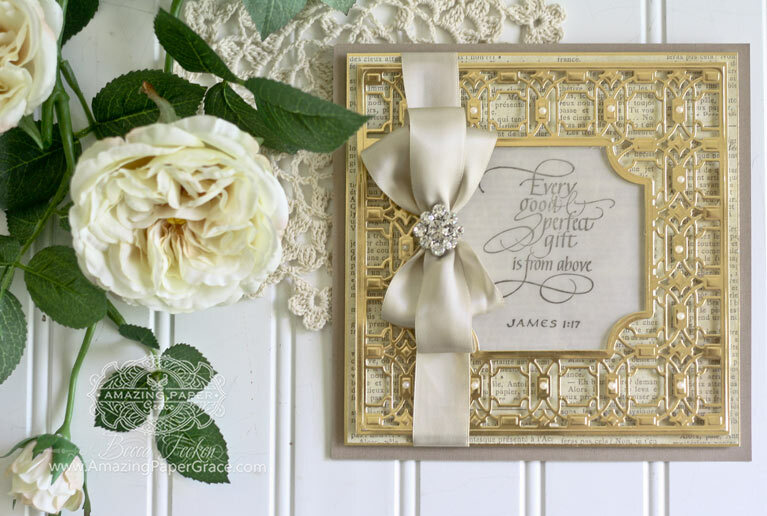 Stunning card made with wonderful die and sentiment. My favourite way of showing kindness is to give my time in the shape of a visit, and to take a “Just Because” or “Thinking of You” card. I think time is the kindest gift of all. BEAUTIFUL card BECCA – the sentiment is perfect!!! I look for where help is needed and try to fill a gap. Needless to say, I send hand made cards to try to uplift, inspire, and bring a smile. I do pride myself that i am always there for my family and friends if they should need anything. Keep calling ur friends and whoever I know they appreciate the effort. I sure do. Sometimes Just a friendly hello is all it takes to brighten ones day. What a stunning card Becca. I am new to your blog, but just love, love, LOVE it. Oh, Becca! This card is really just too gorgeous for words. You are always amazing, and today is no exception! Your creativity keeps me addicted to your blog. Oh Becca, I cannot believe my eyes at how elegant this card is. Like royalty, it is fit for kings and queens! I love love love love that card!!! Soooo beautiful! How simple and absolutely gorgeous. Beautiful Card! Very classic and stylish. It can be used in so many ways. LOVE them that way they will know you are always there for them ! I usually read over comments before responding and I’m so glad I did today because it reminds me why I so appreciate this community. Your friends are a reflection of you – so generous! Today’s card is a beauty with such with a wonderful sentiment. I try to respond with kindness to a person’s wants. My favorite way to respond is to offer prayer. If I don’t know what someone needs, God surely does! SWOON!! I absolutely adore this card – it’s completely fabulous! My husband and I are known as cake bakers! Chocolate brownies, coffee cake and matrimonial cake are our signature bakes. They seem to ease all manner of ills! Good morning Becca, Beautiful card as usual!!! My favourite way to show kindness is just be there and like Carol I too was taught to treat others as you would want to be treated!!! Oh this is so pretty, Becca. I love it. Smiling! I try to make eye contact with people and just smile. Oh My !!! I love this card. When we think of this verse we most often jump to only the good Happy things that happen to us, but I have found that many times that our trials and the darkest hardest times have brought about the most good in our lives. Our loving Father in Heaven disciplines His children. What good loving father would not? My Favorite way to show kindness to a person: Is to just listen and be present with the person I am with. As it truly shows them that I do truly care and love them. Becca, the card is just beautiful just like all the cards you make. My way to show kindness is to tell people something about themselves that makes them smile and feel good about themselves. The cashier in the store may have her nails done beautifully, the teacher may have on pretty jewelry, the teen may have on a t-shirt with a great saying printed on it etc. The card is beautiful, Becca! I have a lot of designer paper that has type on it and would have never thought to use it in this way. Wonderful wonderful die cutting and how I love that stamp too. Don’t have any Quietfire stamps cos I live in Oz, but wouldn’t change that for the world. And Spellbinders keep making such delicious dies. You say it is simple Becca but takes an artists eye to create such a card, thanks for sharing your blessing. I love getting your emails. Beautiful card again today. After seeing this card, I must rethink the Art Deco dies They weren’t my first choice, but now think I’ll add it to my wish list. I just recently found your site and I am in such awe. Your cards and designs are just stunning. Thanks for sharing. My goodness, how do you keep coming up with ideas for these amazing cards! Each is better than the last, and more precious! I can only dream of being anywhere as good as you are, but I guess God is driving your creative spirit and heart. Such a lovely card…and I love the frame and the sentiment together. I’d love to know what the background print paper is…I’m always on the hunt for good text background…. Blessings, Becca. I’m so thankful for all you share. dear Becca, there are so many ways to show kindness ! why not start with a smile and a helping hand,where needed? Or some nice words…like on your cards you show . 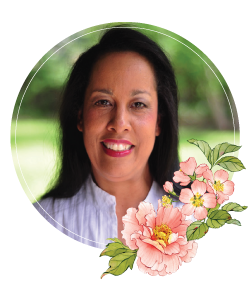 The way I try to convey kindness is to talk to people in a way that they do not have to feel defensive, my tone of voice implies compassion and understanding, it seems to work for me in business and personal very well and I have avoided a lot of conflict once I started using kindness in my words. As to the question of kindness… I feel I do that through a warm smile to as many people as I meet eyes with each day. Who knows what they may be thinking or dealing with? I may not know their interior thoughts but I believe a warm smile always lightens a troubled day and a good day, alike. I use your bow-maker in my class and the ladies have asked if it is still available. Could you let me know? WOW! What a stunning die this is, ooh love this one its a beauty. Stunning card too my friend. I hope you and your family are well? Hi Becca, I love this card !! 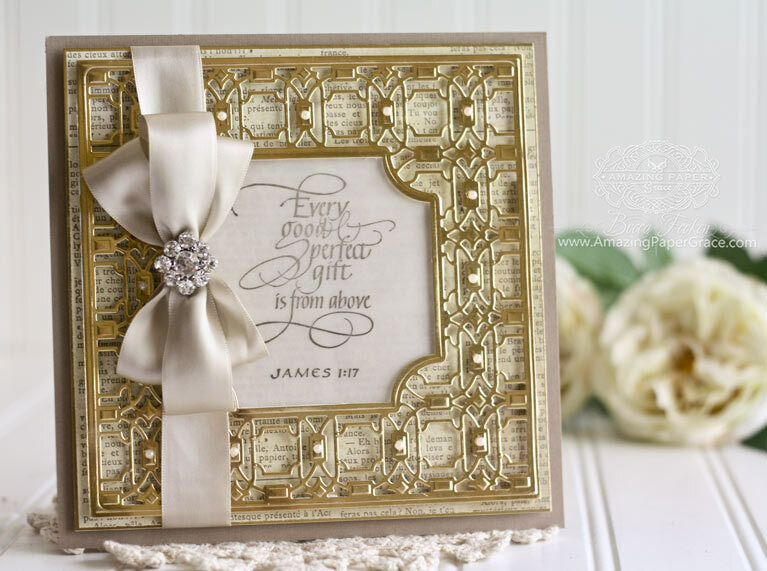 the Art Deco frame die-cut really makes the card, I love it !! This card and last Friday’s card are unique with the sentiment alone but with ur added (I’m at a lost for the word that could actually describe what u add!!) piece of ur. Heart, and many other things; the cards are beyond beyond everything. They make me happy just looking at them. I found another card of yours the other day it made me smile!! So what do I to show kindness sometimes (in fact this happened) If I can sense/tell that a person is having a rough day and I just tell them God Loves You even to a complete stranger. Of course making things like cards, mini albums whatever; the smile on the receivers face tells me that was a kind thing to do and they will appreciate it. Ask our mutual friend what she got for Christmas from me! You always amaze me with such beautiful cards. I learn from you every day. I have you saved under my favourites so I just click on it and see all your beautiful cards you bring to us. Take care.